Matheny was more than the obvious selection here, and it really had little to do with his current role as manager. He has always been a leader and maybe even more suited running the Cardinals on the field than I originally believed. 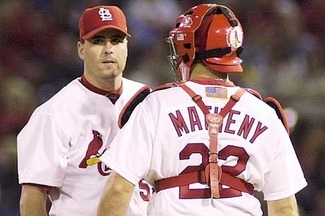 Matheny was the perfect mentor to Yadi, a vocal reminder of DK, and ultimately the right man to take over after TLR. There have been bumps in the road that should have been expected, and the questions could have continued after a rough NLCS last October. 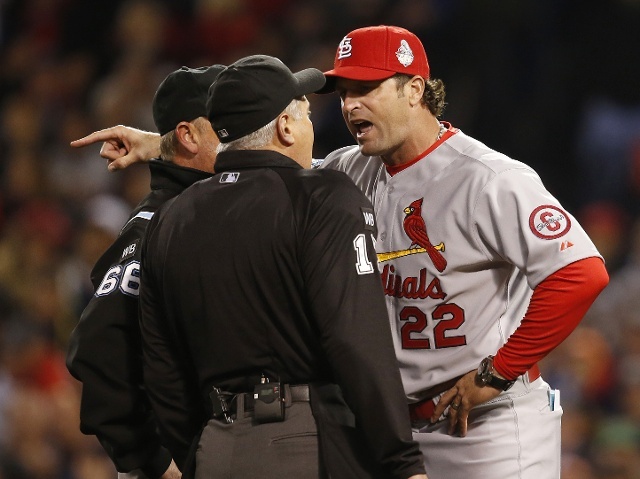 Instead of focusing on game management, Matheny showed exactly why St. Louis found the leader it needed in the toughest of situations. Since the passing of Oscar, the skipper had every right to stay quiet and grieve behind the veil of baseball like so many others have done before him. The Cards did not even have to wonder how the public would view things behind the scenes because Matheny was everywhere representing the franchise. The upcoming campaign will be the true test, though, since the rest of the Central has retooled in hopes of catching St. Louis slipping even a little. As great a defender as Matheny was behind the plate, he will need better deflection skills if the new #22 struggles out of the gate. It would be fitting to have the next decade dominated by a defensive force who seems bigger than life and just the right fit for the Arch city. The Cardinals have already benefited from picking their guy once and just need lightning to strike again.